One of the most successful roadsters available during the 1950s and early 1960s was the Norton Dominator. 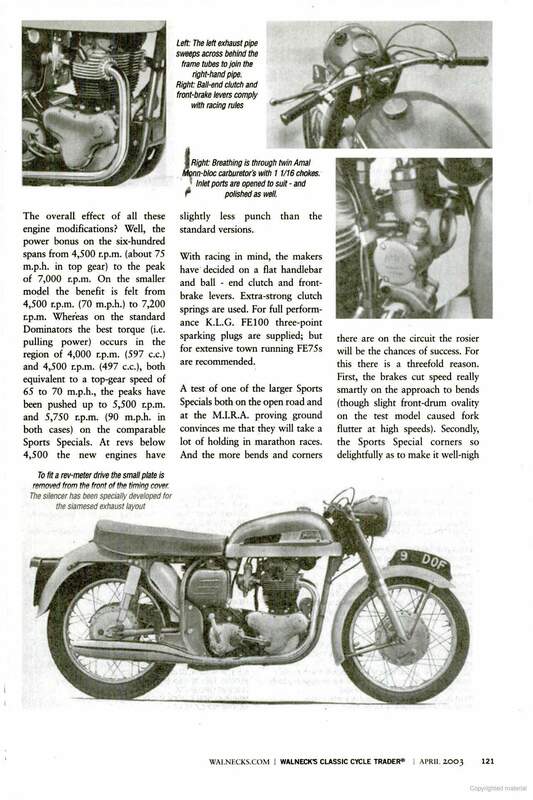 It caused a sensation when revealed along with the unusual Velocette at the Earls Court Show of 1948. 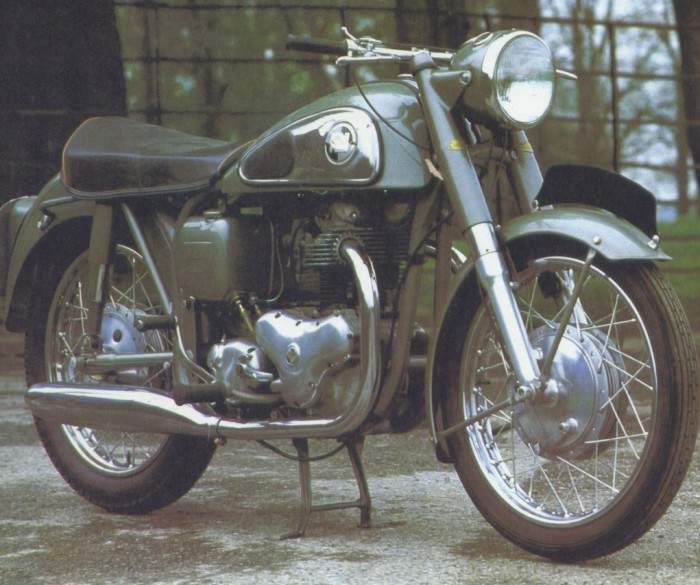 Of 497cc the Dominator was designed by the much respected Bert Hopwood who was formerly associated with the BSA and Ariel concerns. His latest creation was to set the Norton design trend for many years to come. 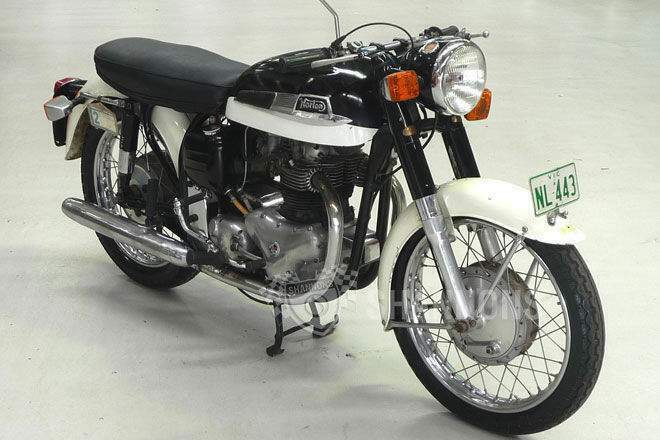 In fact, even the last model produced by the Norton company, the 850 Commando, bears a close resemblance to the Dominator. The engine employed was of the classic vertical twin design with push-rod operated overhead valves. Having a bore and stroke of 66 x 73 mm and a compression ratio of 8.5:1, the Dominator engine was tireless and a cruising speed in the high eighties could be maintained all day long. In 1953 the original plunger type rear suspension was replaced by a more efficient swinging-arm arrangement and shortly afterwards the frame was changed to the famous 'Featherbed'—a legend in itself. 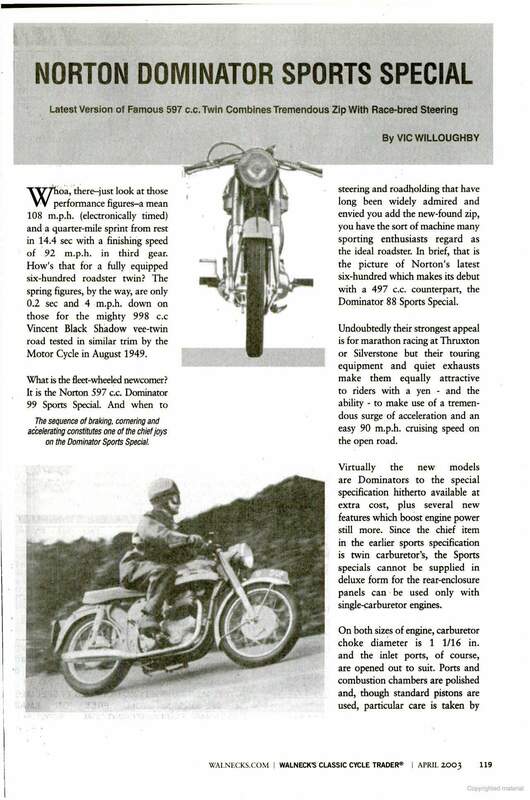 These improvements now gave the Dominator excellent road manners which appealed to the sports-minded enthusiast, who now could experience the race-bred qualities that had previously been confined to the track. The 1961 'sports special' model was typical of, series, despite various modifications over the standard version. Most noticeable was the absence of silencer on the left-hand side. 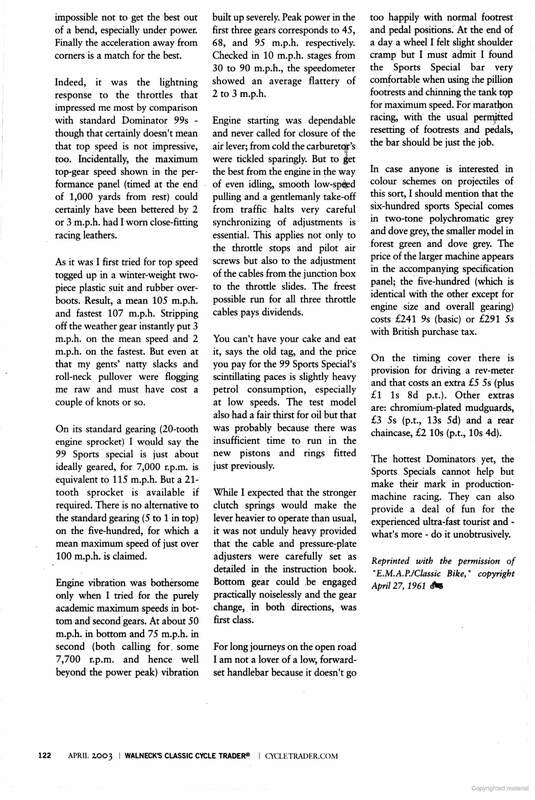 Instead, twin pipes were utilized and this obviously aided ground clearance when enthusiastic riding was called for In fact, ground clearance was so good that only tyre adhesion determined the angle of lean that was available. Handling was also second to none, and on long twisting country roads the Dominator was a joy to ride. With positive steering and taut handling it gave the rider an unsurpassed degree of confidence. Obviously, the 'Featherbed' frame was partly responsible but the suspension was also of a top standard. Roadholder front forks were used and" these were complemented at the rear by adjustable hydraulically damped Girling units. 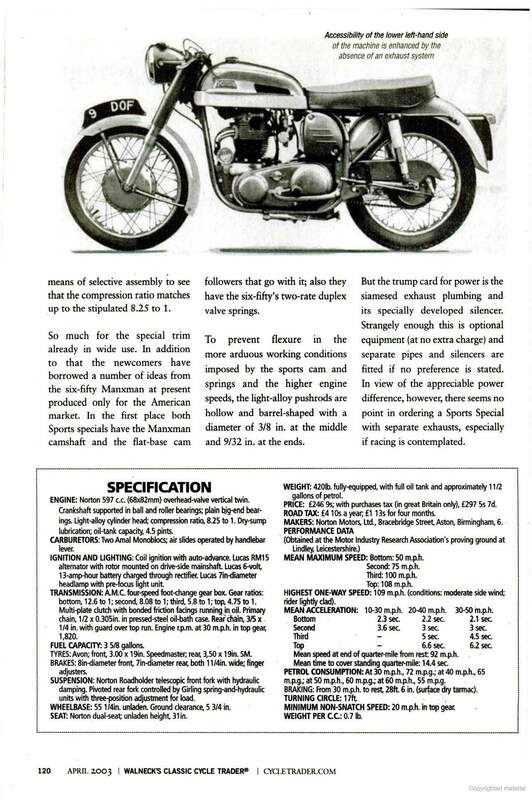 On the sports version the motor produced 36 bhp at 7000 rpm, a good 6 bhp over the standard unit. This was mainly due to the twin Amal Monoblock carburetors being over bored and used in conjunction with bigger inlet valves and ports. Also, special camshaft was fitted and consequently the crankshaft was slightly strengthened in order t take the extra output obtained. Generally, the Dominator had a very good temperament. If starting followed the customary drill then no difficulty was found when starting up a cold motor. After a few kicks the engine would burst into life and the bike would soon be ready to pull away without argument or hesitation. In town the Dominator was docile and pleasant to use, but once on the open road the bike would change into a beast that quickly swallowed up the miles. Into top and the power would begin to surge once it got to 50mph. Brisk acceleration would then continue right past the magic 'ton' until a top speed of around 110 mph was reached. Vibration was always present but it never became unbearable or excessive even when the motor was red-lined through the gears. Even a 7000 rpm in each gear the motor never felt strained and once the next cog was chosen, the Dominator would surge on until all four gears had been used to the full. All changes needed positive use of the clutch, but generally the gearbox was faultless an never caused concern. The bike also excelled in braking. Here, each unit employed was of the drum type with an eight inch at the front and a seven inch at the rear. These could always be depended on to give surefooted stopping whenever needed, and remarkably brake fade never occurred, even when high speed retardation became necessary. In the wet the units remained fully watertight and only tyre adhesion was responsible for the longer stopping distances produced. In the dry, however, a distance of approximately 27 feet could be obtained when braking from 30mph. Despite some niggling faults the bike was nevertheless an excellent sports machine. It cried out to be ridden hard and as a connoisseur's mount the Dominator performed admirably—a true classic.